Lately Lo and I have been talking about getting back on track with eating healthier. This is my favorite salad dressing and it’s super healthy, full of flavor, dairy-free, and perfect for clean eating. I have literally been making this dressing once a week for the last year and I’m not tired of it (yes, I have it memorized!). I love it on taco salads with chopped cilantro. It also works really well as a Caesar dressing. 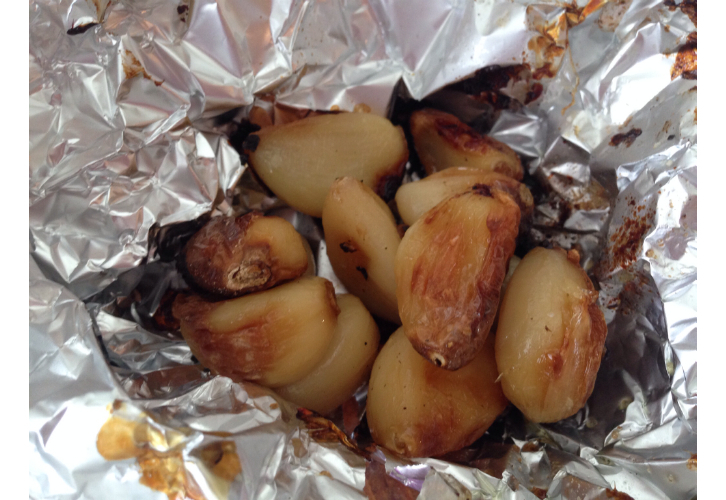 Preheat the oven to 400 degrees F. Place the garlic cloves on a piece of heavy duty foil. Sprinkle with one teaspoon olive oil and season with salt and pepper. Wrap up the cloves in the foil and roast in the oven for 20-30 minutes until the cloves start to caramelize. 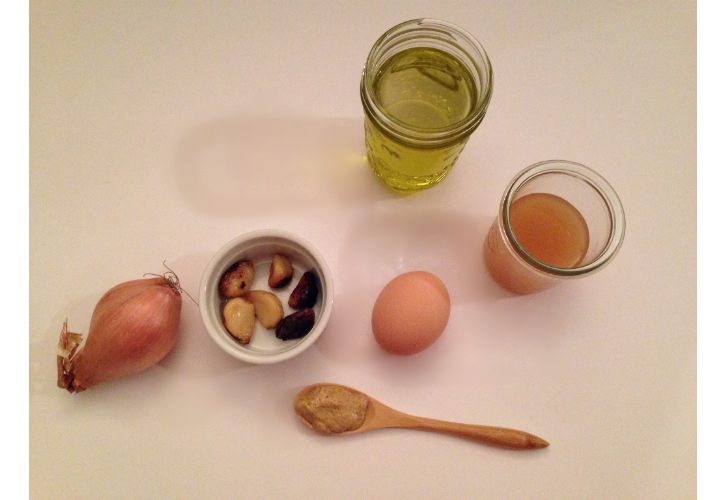 In a Magic Bullet or blender, blend all of the ingredients including the roasted garlic cloves. Store in the refrigerator. 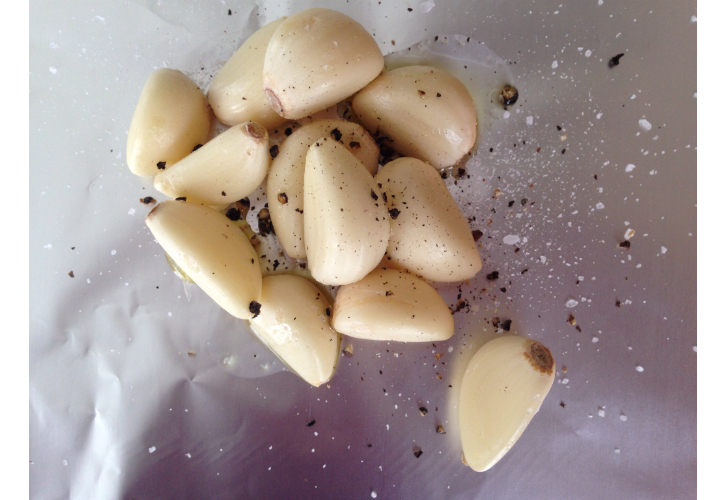 Ok, here are a few tips for roasting the garlic…you can buy the peeled cloves in bulk in some grocery stores. I usually roast double at a time and put half in an airtight container in the fridge ready to make the next batch of dressing! You can also roast a whole head of garlic. Just slice off the top end, add a bit of olive oil and salt and pepper and wrap in foil, roast for about 40-45 minutes. 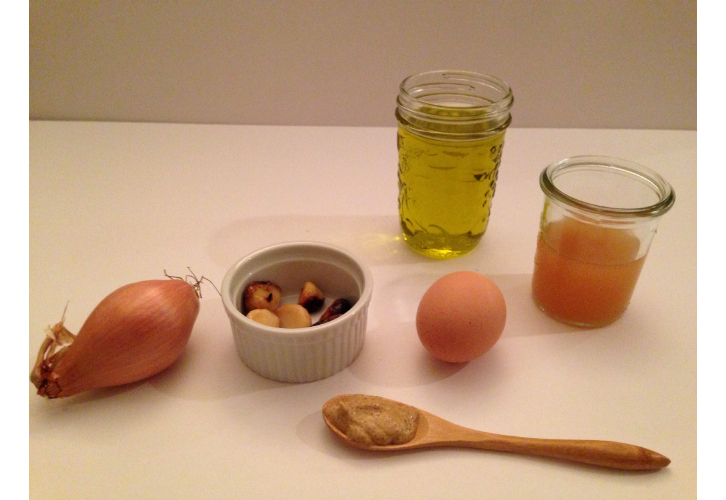 Once cooled enough to handle, carefully squeeze the roasted garlic from the bulb. These caramelized cloves are some serious beauties! Roasting the garlic mellows out the flavor a lot! Another side note…we just bought a Nutribullet by Magic Bullet…it seriously rocks! It pulverizes whole foods in seconds, so when I make this dressing, there’s no need to chop the shallots! 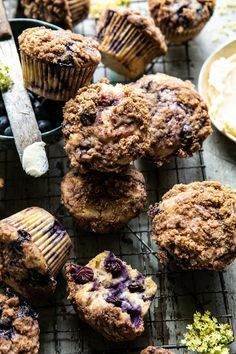 Just put ’em in whole! One of my fave ways to use this dressing is to make a chicken salad for dinner. Chop up some romaine, saute some mushrooms and peppers in a bit of olive oil, top with some cooked chicken breast and add the dressing….SO delish and healthy! 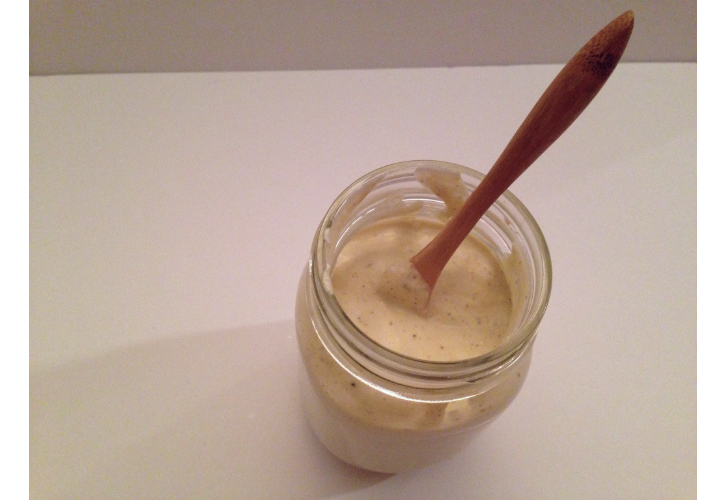 This dressing is very creamy and flavorful!! It’s hard to believe it’s healthy! **Please note that this recipe does contain a raw egg white. Consuming raw or under cooked meats, poultry, seafood, shellfish, or eggs may increase your risk of food borne illness, especially if you have a medical condition.